I have done a lot of shopping recently for Spring and in preparation for my vacation next week. As a result, I know once I am back from Florida it will be necessary for me to really tighten my purse strings. That makes these #stylishforless posts even more important to me. Below are a few fun finds that are below $50. love the little luxuries- such a beautifiul photo too! xO! i am really adoring those earrings! And I actually wanna buy some clear containers as displays for my jewelry now! those earrings are pretty! clinique always has the best gift sets. Little luxuries are amazing, and all these picks are great. I totally know the need to tighten the purse strings... I kind of bought an expensive pair of shorts as my reward for finals (the papers were awful enough that I moved up from sandals... Yeahhh...) and it's definitely made an impact. Beautiful finds dear, I adore the card set and my heart goes out for that stunning bracelet, I am amazed at the price of it!! love the 1st photo all those gorgeous accessories in the clear acyrlic trays love that! so chic and pretty! that pink tassel is so cute! Your blog is stylish, chic and fun! You are invited to follow mine:-) I will follow right back! oooh love that jonathan adler card set! Love these great finds! I love finding something special at an awesome price! I adore the bracelet! 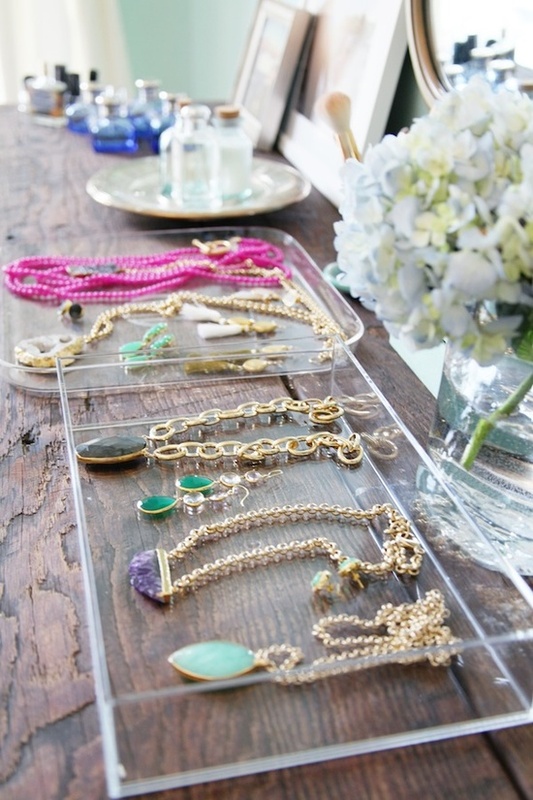 love that necklace tray! what a great idea! fun stuff! Cute picks! Loving the bracelet!